Twas the night of Thanksgiving, I just couldn't sleep. I tried counting backwards; I tried counting sheep. but I fought the temptation with all my might. the thought of a snack became excitation. Thumbing through Mom’s recipe box, I saw this recipe, which would be a great way for your leftover turkey. The recipe is typed (remember typewriters?) on a small piece of paper, on both sides and the sheet is yellowed and sort of messy by now. She usually wrote the name of who she received the recipe from somewhere on the recipe, but not this one, so the source is a mystery. This is very good, and is actually easy to make, not as time consuming or bewildering, as it may seem. 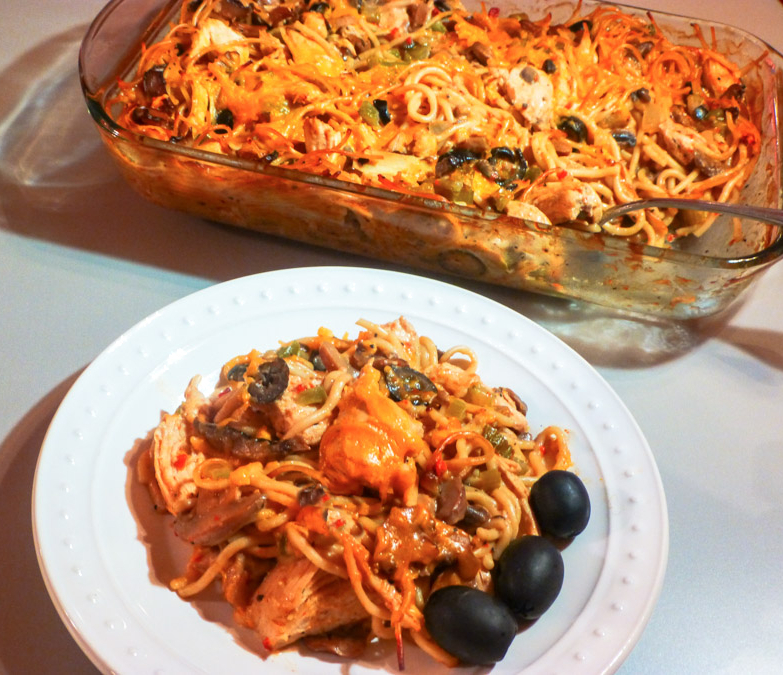 Give it a go for your leftover Thanksgiving turkey ~ it’s delicious! Cook chicken, add salt, pepper and 3 cups water. Cover and cook on high heat until steam appears then turn to low and simmer until tender, about 2 hours. Cool, then remove meat from bones, cut in good sized pieces. Stir in chicken, consommé, and mushroom soup, measure and add water to make 6 ups, return to kettle, heat to boiling. Sauté onion, green pepper and celery in heated shortening; sprinkle with paprika and then add this and pimento to chicken mixture. Then add spaghetti. Cook on high until steaming, then on low until spaghetti is tender, about 39 minutes. If serving, immediately, fold in olives and 1 cup of cheese. Serve on large platter sprinkled with rest of cheese. If made the day before, reheat then fold in olives and 1 cup of cheese. In a large pan, cover chicken with water, add S&P, bring to a boil, reduce heat to simmer and cook until tender, about 20 minutes. Remove chicken from pan; set aside 1 cup broth for later use and use remainder of broth for cooking spaghetti. Cut chicken into bite-size pieces when cool enough to handle. Bring broth; adding water, if needed, to a boil. Cook spaghetti until al dente, about 3 minutes; drain well. Meanwhile, in large skillet, sauté onion, pepper, celery and mushrooms until tender. Blend in reserved broth and soup. Season with paprika and pepper. Add olives, 1 cup cheese and combine. 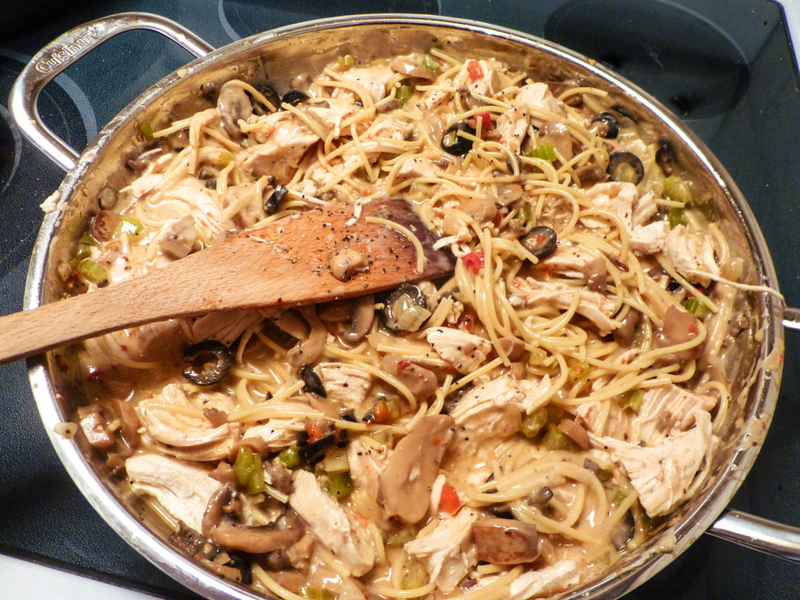 Add chicken to spaghetti mixture and toss lightly. Scatter remaining ½ cup cheese over top. Bake for about 45 minutes, until heated through and cheese melts. Hands down, this is the favorite dish on our Thanksgiving table! 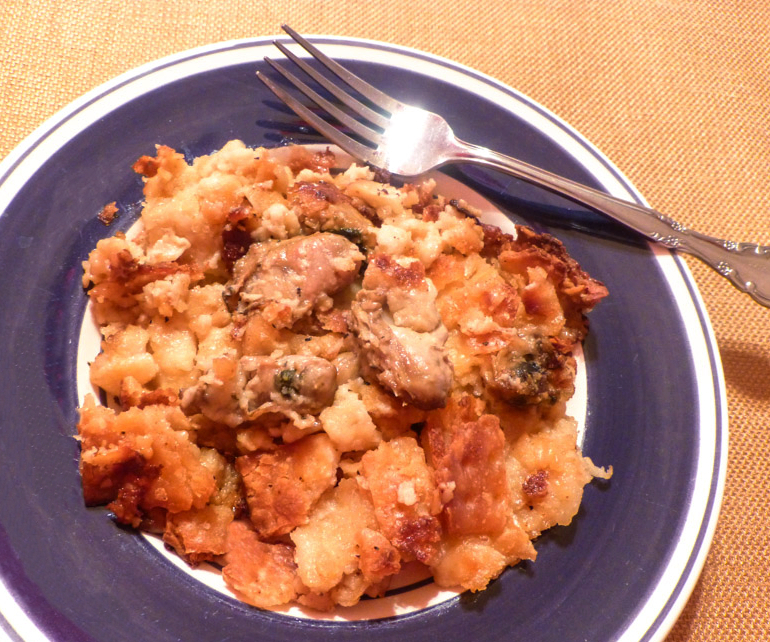 Mom always called it Oyster Dressing and we still do ~ you may remember this recipe from years past, if you’re a follower here. It’s perfect: rich, delicious and succulent. It’s simply layers of rich butter crackers, lots of butter, half and half, seasonings and oysters. Don’t crush the crackers to crumbs; break them up with a light touch. Use less crackers for a crisper dish. Just "do what I say and not as I did" last Thanksgiving! I made the dish, and baked it, but when I pulled it out of the oven, it looked very strange. It was totally dry and crisp and hard as a rock. Then it dawned on me, I had forgotten to add the half and half. I’m back at blogging! Thanks for all your concerns; everything is fine here, and I hope it is by you. I just wanted a break, giving me extra time to pursue other interests. 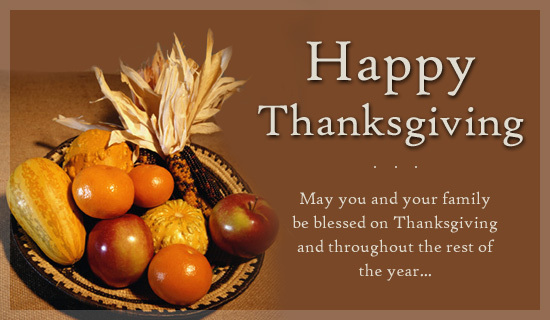 Now, on to this great dish for your Thanksgiving dinner table. I’ve tried a variety of stuffing recipes over the years, but this one from a chef friend is our favorite and I’m sticking with it. It’s a recipe here on my blog that begged to be reposted. 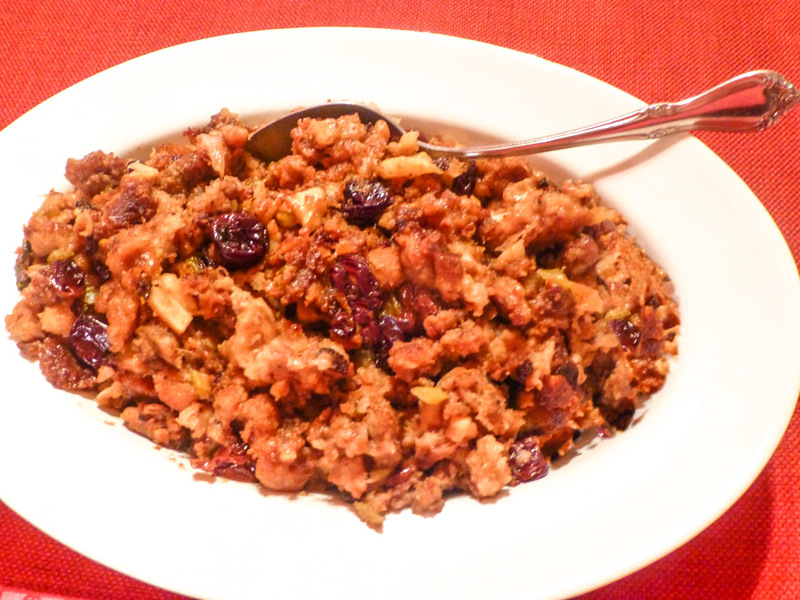 Italian sausage, Honeycrisp apples, dried cherries, orange liqueur provide savory sweet flavors for the stuffing. Even try a mixture of dried fruit. This recipe makes a lot of stuffing ~ lucky you, should there be leftovers. Here’s hoping you give it a try and enjoy it as much as we do! Place cherries (dried fruit) in a small saucepan and cover with 1 cup orange liqueur. Bring to a boil, remove heat and set aside. Sauté celery and onion for about 10 minutes. Using the same skillet, cook sausage until crumbled and brown, drain well. Place sausage and stuffing mix in bowl with celery and onions. Stir in cherries and liqueur mixture, pecans and apples. Mix in melted butter, broth and remaining ½ cup orange liqueur. Stuffing should be completely moistened. Butter and fill a 15” x 10” baking dish with stuffing. * Use any mixture of dried fruit you like: cherries, cranberries, raisins, dates, etc. This is truly ultimate stuffing!